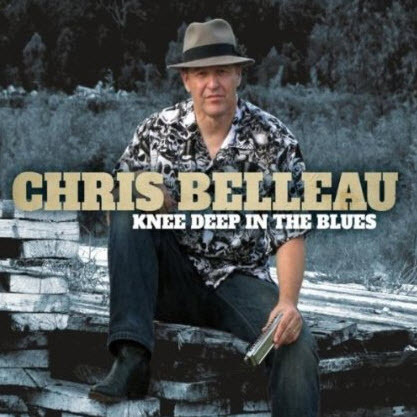 Talented multi-instrumentalist and vocalist Chris Belleau seeks to provide a taste of true New Orleans gumbo with his third and latest release, Knee Deep in the Blues. The talented Belleau bellows out with a sweet creole voice sure to seduce the unsuspecting and critical listener alike to a tour of a city whose music is as diverse as anywhere in the world. Moreover, Belleau knows his stuff and creates a unique blend of jazz, zydeco, country and blues into a 53 minute long foot-stompin’ party. The beauty of this record is the beauty of New Orleans: it’s good music, played by laid-back musicians. One can imagine as Belleau kicks the party off with a grimy blues shuffle (“Let It Go”) that the drummer has just walked in, late as usual and having to borrow a pair of sticks from a kind member of the audience. Succinctly syncopated saxophones combine with Belleau’s tenacious trombone to add some Cajun spice to this melting pot of rhythm and blues. Belleau breaks out the funk with “Angels in the Swamp,” as our tour takes us from a smoky blues club full of crusty blue misers to a riverboat full of modern-day hepcats spicing up a standard 12 bar blues with jazz harmony, electric keyboards and a classic funk groove. The hepcats bang out a couple more tunes as an old zydeco accordion player joins the fun on “Keep on Tryin’.” The soulful R&B sound of New Orleans greats like Percy Mayfield and Allen Toussaint comes alive with “Knee Deep in the Blues” and “Raining in My Heart,” before the last two tracks: another classic blues shuffle (“Things that I Used to Do”) and a closing track that – in typical New Orleans fashion – cannot be described with words (“Wooly Bully”). This is a nice album by a talented musician. Belleau – a trombone player with the late, great Clarence “Gatemouth” Brown for many years – doesn’t play much trombone on this record. Instead, he turns to his myriad of other instruments: harmonica, Cajun accordion and a beautiful, easy-going New Orleans voice. That being said, the trombone is – in this critic’s opinion – an underutilized instrument in the blues. It is head-scratching that a fabulous trombonist such as Belleau would not make much use of his primary ax. He plays some nice background lines, but he never takes a bone solo. It would have been nice to hear a little more trombone on this album. The only other criticism is of a couple of the country-based tunes on the album. “Hole in My Heart” and “Jolie Blond” sounded just a bit hokey to this critic’s ears, almost as if Belleau was trying to emphasize his down-home personality. While his down-home, easy-going personality is what makes this record great, it seems as though it was exaggerated just a bit in those two tunes. Nonetheless, this is a pleasant record, one that is sure to get your foot tapping and one that is well worth a listen.